Who doesn't love baskets? Use that novelty fabric that has been sitting in your stash to make a unique gift for a friend or for yourself. Make them big, make them small, make them for absolutely no reason at all! This tutorial is mostly pictures as they are worth 1,000 words and I know you don't want to read 1,000 words. First cut two squares - one for outside and one for inside. Any size as long as it is at least 10". I like the 12" to 14" size but also make whatever size my scrap is as long as it's over 10"
Cut two layers of batting the same size as your squares. Here in the photo I used red felt instead of one of the batting layers just because I have a lot of red felt to get rid of. The felt is alittle hard to sew thru so do as I say and not as I do and use two layers of batting. Lay the two squares on top of the batting and sew all the way around leaving one side with an opening. Turn inside out, use a blunt instrument of non destruction to poke out the corners. Turn under where the opening is and sew closed by hand. 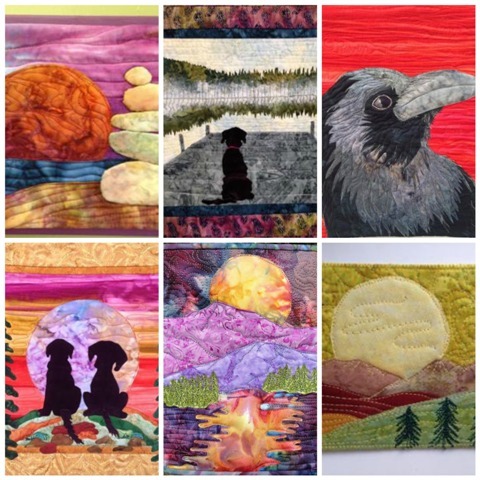 Quilt - great place to practice your free motion quilting. Fold in half with the inside of the basket facing out. On the folded side, mark with pencil 2" up from the folded edge and the same along the folded edge. Sew from mark to mark. Do the same on the other edge of the fold. So you have two corners sewn, now open it up and fold in half the other way. Mark and sew those two corners the same way. Fold down the flaps and sew down with buttons. The inside of the basket will have these little flaps which you can sew down flat by hand or just leave them. Voila! You have a basket! I've been really enjoying making these fabric baskets that I saw Alex Anderson make on one of the quilt shows (the week end it was free). They are quick, you get to play with fabric and practice free motion quilting plus there is couch time hand sewing on the buttons. You use two colors that play well together. You can even make one to hang on the wall! Think I like this one the best of them all! The next one I make I will take some photos and show you how to make them. This little art quilt is only 8"X11" so the words are written in with a marker but I would like to try a bigger one and try to FMQ in the words. That would be cool. Even with the marker I made a mistake by first putting a line at the top of the T , then putting a line in the middle also. Since the writing was the last thing I do, I either have to live with it or chuck the whole thing. I decided to first out white paint and then shade that as much as I could with Inktense pencil. I still see it and now so do you since I pointed it out but it's ok. I wouldn't sell this because of it but will look fine in my office at work. Spiraling above a fishing boat or squabbling at a dock or parking lot, Herring Gulls are the quintessential gray-and-white, pink-legged "seagulls." They're the most familiar gulls of the North Atlantic and can be found across much of coastal North America in winter. Some call them pests but no one can deny their beauty especially when they are soaring through the sky. Harry was made using both freezer paper and fusible appliqué, Inktense pencils for shading and lots of free motion quilting. The background is quilted with swirls reminding me of the ocean breeze. Not much quilting done this week as I just got back from a glorious vacation in Old Orchard beach Maine. The season doesn't start for a few months so the place is deserted - 7 miles of sandy beach all to my self! I did bring stuff to create some fabric art though. Here's my "hotel studio"